Feel the relaxing flow of the river: River White Granite White Cabinets Backsplash Ideas. The combination of smooth white, cream, and gray movements is speckled by soft light green, burgundy, cream and white. Another “fall in love” kitchen remodeling is for your review. In River White Granite White Cabinets Backsplash ideas, the duet of the subway tiles with full high backsplash or, arabesque tiles are amazing. You may use some carved inlayed tiles while you have very pale subway tiles. By playing with different tiles, you may bring some extra movement to your flowing countertop. Let me give first the material and the characteristics of the backsplash then, the color and stain of the white cabinets will be defined under each picture. Soothing Agent: River White Granite Countertops article contains some good pictures for your design ideas. The backsplash colors for River White Granite White Cabinets Backsplash Ideas can be white, beige, brown and gray tones. The material for the backsplash can be glossy ceramic, glass or stained glass, travertine, natural stone, marble and River White Granite full high backsplash. The type of the backsplash tile would be subway, arabesque, matchstick, mosaic or carved. I would love to show River White Granite White Cabinet Backsplash Ideas by sharing the delectable pictures. Picture Credit:Becky Seidenberg.,River White Granite with Benjamine Moore Decorator White Cabinets and Carrara Marble Subway tile and Walker Zanger Vibe White arabesque tiles. Dark flooring is a combination of Costen floors 3 parts english chestnut, 1 part jacobean. Such an eye candy for all white lovers. 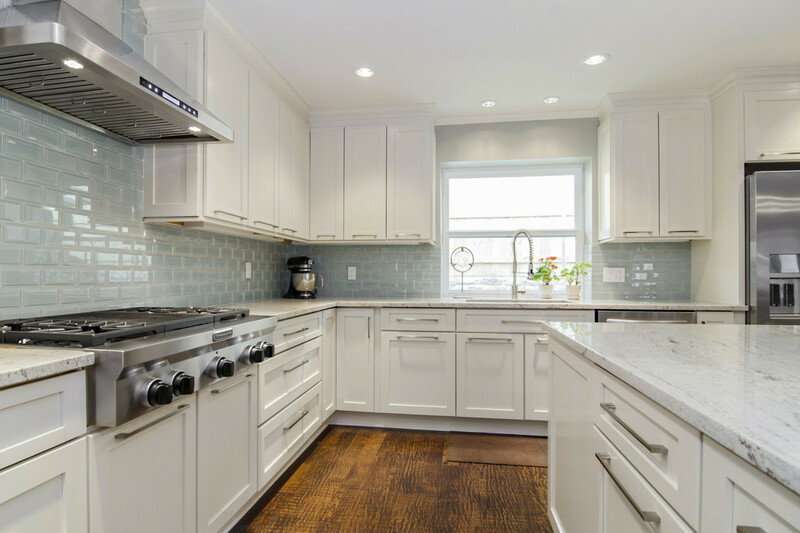 River White Granite with Cashmere White Colors Kitchen Cabinets, Beveled Glass Subway Tile and Solid Oak Flooring. Picture Credit:Hatfield Builders and Home Remodelers.Cashmere color cabinets with River White Granite embellished with Solona Beveled Smooth Gray Glass Subway tiles , solid oak floor that was scraped and finished with beautiful Stainless Steel Appliance. Classic, clean and full of light design. River White Granite Countertop, Island Top, Raised Breakfast Bar with White Cabinets, Stained Mosaic Glass Tile and Diagonal Set Up Cumaru Flooring. Picture Credit: Barker Kappelle Construction, LLC.,River White Granite countertop, island top and raised breakfast bar with white cabinets and Vihara Puka Iridescent stained mosaic glass tile backsplash combined very well with diagonal set up Cumaru Hardwood flooring to finish the final touch for the kitchen remodeling. Picture Credit: Tina Colebrook Architect via Houzz., River White Granite with Brookhaven Nordic White cabinets. Combination of river white granite backsplash and ADKO glass subway tile in Taupe. Dark Flooring and dark pendants rock. Functionality meets elegance. Picture Credit: Veranda Interiors via Houzz., River white granite countertop and overhang island top with kitchen cabinets painted Benjamin Moore White Dove, Tile Ledge Stones Backsplash and Tierra Sol Green Earth Aurora Graphite Glass Mosaic Tiles and amazing “”Finished on site 3″ quartersawn white oak with custom stain”” The Quarter Sawn Oak cut pattern produces a very beautiful grain pattern and also a very stable floor. All the theme completes well by having stainless steel appliance and stainless steel kitchen pendants. Hats off design. Picture Credit: Ridgewater Homes Inc., River White Countertop with custom made white kitchen cabinets and travertine subway tiles and carved travertine ( I will get the name as soon as possible) inlay backsplash. Read oak flooring brings enough opposite to show the beauty of the detailed work. Picture Credit: Ripano Stoneworks., River White With Gray Ceramic Subway Backsplash, White Ceramic Arabesque Tiles, White Cabinets and Stainless Steel Vent Hood. Neat looking kitchen. Please make this article more readable by dropping a comment about River White Granite White Cabinets Backsplash Ideas. Thank you for your time.